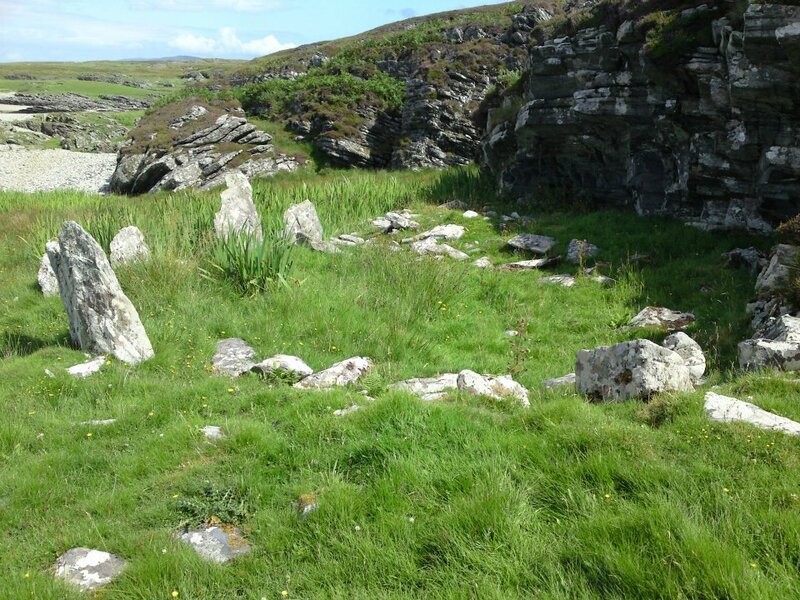 This delightful stone circle was photographed by Claire Wickham, who lived on the Isle of Islay in Scotland for many years. I'm not sure exactly where this stone circle is, but it is beautiful. From the photo, it looks as though it is in a sheltered spot on the edge of a beach, with a rocky cliff behind it. I imagine a small and secluded stone circle like this, hidden away from the tourist trail, would be an extremely magical place. Thanks very much Claire for letting me your lovely photo! The photo is copyright Claire Wickham. That is between Ardnave and Sanaigmore in the north west of Islay. I very much doubt it is a stone circle though I'm afraid. It's more likely the remains of some kind of enclosure or hut.